Following the decision of allowing visa-free travel for 5 European countries, Vietnam announced to cut stamping fee for Visa on Arrival (VOA) in a bid to boost tourism. From November 23, 2015, the standard stamping fee will be reduced to US$25 from US$ 45 for 30-day single-entry visa and US$ 50 from previous US$95 for three-month multiple entry visa. For travelers enter Vietnam under the visa waiver program, if they want to re-enter Vietnam less than 30 days after the prior visit, they have to apply for a visa and the stamping fee for a single entry visa is reduced to US$ 5 from US$ 45. Fees for multi-entry visas with a validity of more than 3 months and less than 6 months will remain unchanged at $95. Travelers can now pay a lower fee for getting Vietnam visa on arrival. The photo was taken in Notre Dame Cathedral, Hanoi Vietnam. Vietnam decided on the new rates for a visa after having referred to the visa fees in other regional countries. Previously, Vietnam charged a comparatively higher visa fee than its neighboring countries like Thailand, Laos, and Cambodia. "We are informing our customers about this good news. 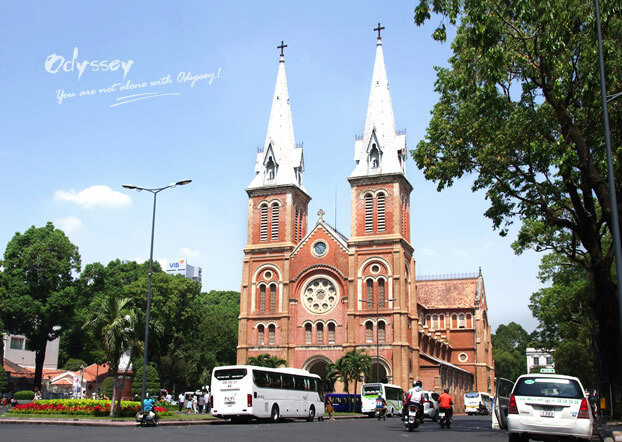 The lower visa stamp fee will save a lot for them, especially for those entering Vietnam then travel on to Laos and Cambodia and re-enter Vietnam in order to return home, " said Wanda Tang, Odyssey Sales Manager. "Though the cost for getting Vietnam visa on arrival is reduced, travelers still run the risk of waiting up to 90 minutes in the airport while the visa officers decide whose turn it is to do some work. For those who hate long-time waiting, it's still advised to get the visa before you leave," she further added.